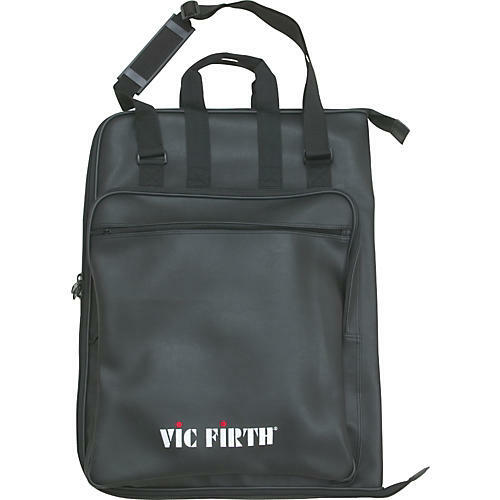 The Vic Firth Concert Keyboard Bag is armed with 16 gusseted interior pockets for holding plenty of sticks and mallets. 4 pencil pockets and 2 smaller pockets handle other necessities. The interior also features a corduroy lining and flap that covers the mallet heads, assuring ultimate protection of the yarn and cord of any keyboard mallet. An oversized double-zipper provides easy access from the top or bottom, and double stitched loops suspend the bag from the bar post of any keyboard instrument. Additionally, outer pockets expand for storage of music and accessories. In a water-resistant leather-like vinyl with double stitching throughout, this bag is durable, attractive, and affordable. 24" x 16". A synthetic bag that has the look of fine Corinthian leather! Order today.